Vivid red mangoes full of Kochi’s sun’s essence are packed by Murata Seikou, owner of Murata Farm. He then puts a sticker and an address on the boxes as they will be trucked to customers who ordered them from all over Japan. They are destined to be someone’s smile every year. These are “Yosakoi Mangoes”, and they are raised with a lot of love by Murata Seikou and Yuriko’s husband and wife team at Murata Farm in Ino. Most farmers depend on agricultural cooperatives (JA) to sell their farm products. However, some have stopped relying on agricultural cooperatives and are turning to new ways to market their produce. Murata Farm is such a farm. Seikou and Yuriko started to grow mangoes 15 years ago. Prior to that, they raised ginger, a special product of Kochi. The reason for growing mangoes was that he was invited by acquaintance. After hearing this, Seikou decided to join his team. But now the team is broken, Seiko is farming with only four people including his wife. Actually, the number of people who quit agriculture is increasing. It is difficult to make a living farming. “The optimum temperature for growing mango is 30 degrees. Too warm is not good for mango,” Seikou said. A large air conditioner is necessary to maintain that temperature. The electricity bill to run it is very expensive. There are also various required machines and maintenance. This farm produce about 15,000 mangoes every year, but not everything will be for sale. Mangoes that are not for sale are processed into sherbet. Mango would seem to be profitable, but their annual income is not so large. As with the expenses, it gets even smaller. “We are living at the limit,” Yuriko said. When farmers sell products through agricultural cooperatives, they have to pay compounding fees and can not get the price they want. According IJU info (http://web-iju.info/data/data_14.htm), in 2006, 50.8% of the farmers rely on the agricultural cooperative sales route. Direct sales to consumers accounts for 46.9%, not much different from the number of farmers who rely on agricultural cooperatives. 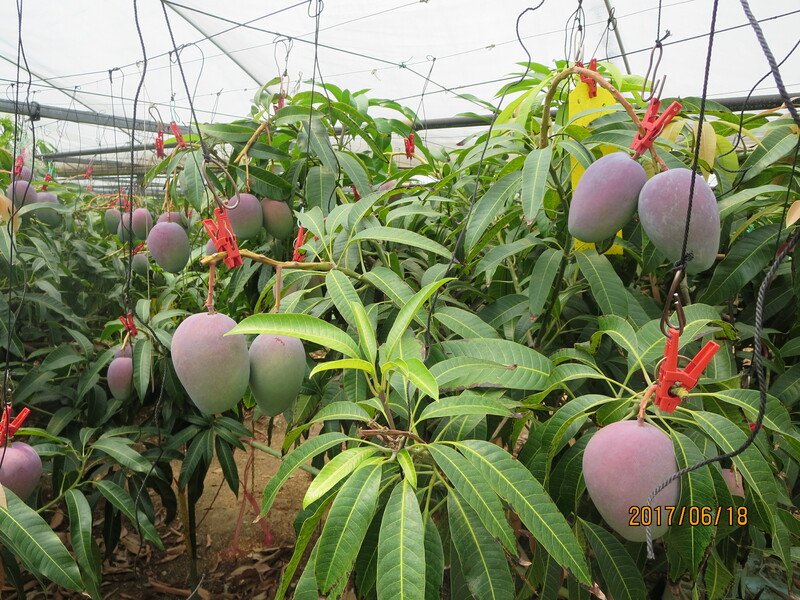 Ninety percent of mangos from Murata farm are sold directly to customers ordered by telephone or fax. The remaining ten percent is sold to outlets such as the Daimaru department store, the Sunny Mart grocery chain, and roadside shops known as Michi-no-eki. According to a graph of the elapsed years after farming for each sales route in IJU info, in 2006, 60% of the farmers in the 1st and 2nd years are reduced to 45% in the 5th year. In contrast, selling directly to consumers has increased from 42% to 51%. Based on this data, farmers noticed the disadvantage of selling through agricultural cooperatives as they advance agriculture, and it is expected that they shifted to direct sales. It is very hard to make a living by agriculture as farmers must battle nature, and the harvest and income are not stable. Agricultural cooperatives are organizations that provide various supports, but they are incompatible with some farmers like Murata farm. Such farmers will shift to direct sales. It means it is important to maintain the current situation rather than aim too high. “Even if we increase production and shipment any further in this state, there is not enough hands, and it is best to do as much as possible with the current size of our operations,” Yuriko said. Farmers are facing some difficulties but their effort is so grate! I want to try this mango someday. Good story! I felt that only a few successful farmers can make a living without agricultural cooperatives. I also wrote article about farmer and I can realized how hard farmer make a living as only farmer. It’s good article to know present states of farmers. I learned there are many hard things to produce them. would like to have Yosakoi Mangoes!! Yosakoi mango that is loved by the farmer looks very delicious. Mango is the best fruit ever! These attempts will help Kochi to sell better mangoes than Miyazaki! The passion makes mango and it should be good quality. I want to eat once. I like Mango, so it gives good chance to know the real in Kochi. I didn’t know about Yosakoi Mango but it looks very nice! I want to eat these. Good story! I sympathized with Yuriko-san’s word. “We are living at the limit”. I want to go there. I was impressed in how they are making an effort to produce high-quality mangoes facing a difficult situation. I want to try this mango someday! I think this article’s good point is mentioning about both advantage and disadvantage to join JA and showing an example of way to live without JA.